“The Christian teacher has to be taught before he can teach. And the Christian teacher has to recognize an ongoing process of being taught. Especially in a field like history, the teacher has to be a person of many books and much reading. I generally think a person has to read ten books on a particular subject before he can intelligently follow a conversation among the experts. 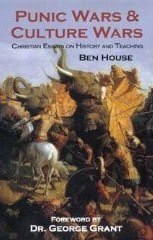 I don’t mean ten books on history in a broad sense; what I mean is that you need to read ten books on the American War for Independence, or the Protestant Reformation, or the Crusades before you can follow the conversation on those particular topics. By the time you have read fifty to a hundred books on a particular area, you can begin to really understand the subject. These numbers are arbitrary, but this truth is certain: Never assume that having read a book on a subject makes you an expert in that area. After reading one book you know something, or a lot of somethings. After ten books, you begin to realize how much don’t know. After a hundred books, you might know what it is you don’t know” (139-140).